It's A New Day.... Start It With Better Health! All of our therapies are safe, effective, and chemical free ways to promote the body's remarkable self-healing abilities. 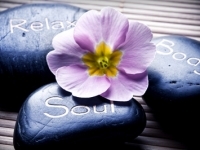 Why Choose Carolina Holistic Health? Carolina Holistic Health LLC offers Acupuncture and Herbal therapy enhanced with modern technology. The addition of modern technologies allows patients to find relief from their current symptoms quicker, thereby saving them time and money. Melt away your pain, stress, digestive woes, allergies, hormone imbalances, lymphatic congestion and toxicity in a relaxed, nurturing environment. Solving the underlying causes of our patients health issues and empowering them during their healing journey through education, compassion, and a team approach is the Carolina Holistic Health philosophy. Are you ready to make lifestyle changes to improve your overall health...body, mind, and spirit? Entrance is on the main level facing Stone Ave. and parking is behind the building.